Labor Day is coming up, which means some of us will be blessed with a day off of work, in appreciation of all the hard work that we do. Labor Day makes me think about the whole process of creating, buying and selling products. I envision labor unions, fair trade, ethically produced items, education for consumers, product quality, et cetera. This blog will touch on a number, if not all of these thoughts. The principal guidelines for organic production are to use materials and practices that enhance the ecological balance of natural systems and that integrate the parts of the farming system into an ecological whole. Sweatshop-Free Union-Made Hoodies: As I mentioned, Labor Day brings up thoughts of unions and their advocacy for workers. Since these sweatshirts are both sweatshop-free and union-made you can be sure that your hoodies were produced in an ethical working environment. In fact they were produced by the UNITE shop in Bangor, PA which is represented by the Allentown-Easton District Council Locals 111, 234 and 243. Ethically produced items make me feel all warm and fuzzy, kind of like these great sweatshirts. Klean Kanteen Stainless Steel Water Bottles: Stainless Steel (and metal generally speaking) is becoming a common household option for a safe alternative to plastic (Bisphenol A: BPA) water bottles. With the frenzy of media attention about the safety and health concerns of plastic water bottles, people are now choosing metal options. The Environmental Working Group advocates for consumers' safety through education. They are a valuable resource when looking at possible safety concerns of consumer goods. Check out their blog regarding BPA: "Your BPA Questions: Answered." Also, check back with Wedge Worldwide because we are looking forward to receiving the Klean Kanteen water bottles in more sizes and colors very soon. 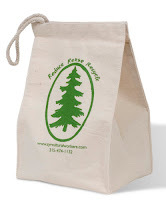 Fair Trade Reusable Cotton Lunch Bag: Along with the commotion around plastic water bottles, comes the realities of plastic bags and the rampant use of them. Reusable products are an important alternative to disposable products; reusable bags only being one solution and category of this massive issue. But it all brings us back to the basics of the eco and green movements: Reduce, Reuse, Recycle.